This article shows you how to develop a simple Windows Presentation Foundation (WPF) application that includes the elements that are common to most WPF applications: Extensible Application Markup Language (XAML) markup, code-behind, application definitions, controls, layout, data binding, and styles. Use XAML to design the appearance of the application's user interface (UI). Write code to build the application's behavior. Create an application definition to manage the application. Add controls and create the layout to compose the application UI. Create styles for a consistent appearance throughout an application's UI. Bind the UI to data to both populate the UI from data and keep the data and UI synchronized. By the end of the walkthrough, you'll have built a standalone Windows application that allows users to view expense reports for selected people. The application is composed of several WPF pages that are hosted in a browser-style window. The sample code that is used to build this walkthrough is available for both Visual Basic and C# at Introduction to Building WPF Applications. For more information about installing the latest version of Visual Studio, see Install Visual Studio. The first step is to create the application infrastructure, which includes an application definition, two pages, and an image. The New Project dialog opens. Under the Installed category, expand either the Visual C# or Visual Basic node, and then select Windows Desktop. Select the WPF App (.NET Framework) template. Enter the name ExpenseIt and then select OK. Visual Studio creates the project and opens the designer for the default application window named MainWindow.xaml. This walkthrough uses the DataGrid control that is available in the .NET Framework 4 and later. Be sure that your project targets the .NET Framework 4 or later. For more information, see How to: Target a Version of the .NET Framework. Open Application.xaml (Visual Basic) or App.xaml (C#). This XAML file defines a WPF application and any application resources. You also use this file to specify the UI that automatically shows when the application starts; in this case, MainWindow.xaml. This XAML file is the main window of your application and displays content created in pages. The Window class defines the properties of a window, such as its title, size, or icon, and handles events, such as closing or hiding. This app navigates to different content depending on the user input. This is why the main Window needs to be changed to a NavigationWindow. NavigationWindow inherits all the properties of Window. The NavigationWindow element in the XAML file creates an instance of the NavigationWindow class. For more information, see Navigation overview. Set the Title property to "ExpenseIt". Set the Width property to 500 pixels. Set the Height property to 350 pixels. Remove the Grid elements between the NavigationWindow tags. This file is a code-behind file that contains code to handle the events declared in MainWindow.xaml. 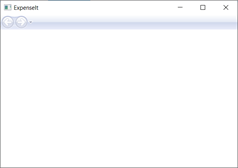 This file contains a partial class for the window defined in XAML. You can toggle the code language of the sample code between C# and Visual Basic in the Language drop-down on the upper right side of this article. In this section, you'll add two pages and an image to the application. In Solution Explorer, right-click on the ExpenseIt project node and choose Add > Page. 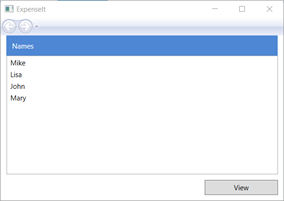 In the Add New Item dialog, the Page (WPF) template is already selected. Enter the name ExpenseItHome, and then select Add. This page is the first page that's displayed when the application is launched. It will show a list of people to select from, to show an expense report for. Set the Title to "ExpenseIt - Home". 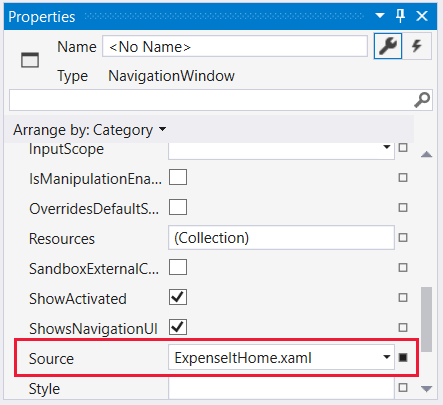 Set the Source property on the NavigationWindow to "ExpenseItHome.xaml". You can also set the Source property in the Miscellaneous category of the Properties window. In the Add New Item dialog, the Page (WPF) template is already selected. Enter the name ExpenseReportPage, and then select Add. This page will show the expense report for the person that is selected on the ExpenseItHome page. Set the Title to "ExpenseIt - View Expense". Open ExpenseItHome.xaml.vb and ExpenseReportPage.xaml.vb, or ExpenseItHome.xaml.cs and ExpenseReportPage.xaml.cs. When you create a new Page file, Visual Studio automatically creates a code-behind file. These code-behind files handle the logic for responding to user input. Add an image named watermark.png to the project. You can create your own image, copy the file from the sample code, or get it here. Right-click on the project node and select Add > Existing Item, or press Shift+Alt+A. In the Add Existing Item dialog, browse to the image file you want to use, and then select Add. To build and run the application, press F5 or select Start Debugging from the Debug menu. Close the application to return to Visual Studio. Each of these layout controls supports a special type of layout for its child elements. ExpenseIt pages can be resized, and each page has elements that are arranged horizontally and vertically alongside other elements. Consequently, the Grid is the ideal layout element for the application. For more information about Panel elements, see Panels overview. For more information about layout, see Layout. 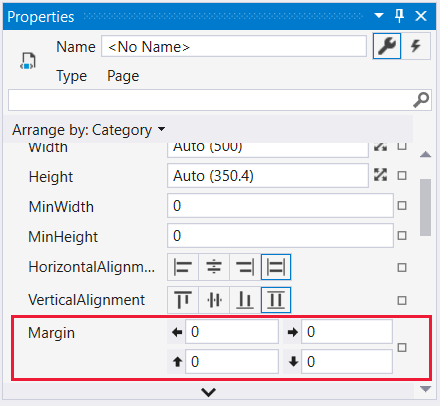 In the section, you create a single-column table with three rows and a 10-pixel margin by adding column and row definitions to the Grid in ExpenseItHome.xaml. The Height of two rows is set to Auto, which means that the rows are sized based on the content in the rows. The default Height is Star sizing, which means that the row height is a weighted proportion of the available space. For example if two rows each have a Height of "*", they each have a height that is half of the available space. In this section, you'll update the home page UI to show a list of people that a user can select from to show the expense report for. Controls are UI objects that allow users to interact with your application. For more information, see Controls. ListBox (for the list of people). Label (for the list header). Button (to click to view the expense report for the person that is selected in the list). Each control is placed in a row of the Grid by setting the Grid.Row attached property. For more information about attached properties, see Attached Properties Overview. You can also create the controls by dragging them from the Toolbox window onto the design window, and then setting their properties in the Properties window. In this section, you'll update the home page UI with an image and a page title. Move the controls to the second column by setting the Grid.Column property to 1 in each of the three controls (Border, ListBox, and Button). Move each control down a row, by incrementing its Grid.Row value by 1. <Button Grid.Column="1" Grid.Row="3" Margin="0,10,0,0" Width="125"
Before the Border element, add a Label with the content "View Expense Report". This is the title of the page. <Label Grid.Column="1" VerticalAlignment="Center" FontFamily="Trebuchet MS"
Add a Click event handler to the Button element. For more information, see How to: Create a simple event handler. Add the following code to the ExpenseItHome class to add a button click event handler. The event handler opens the ExpenseReportPage page. 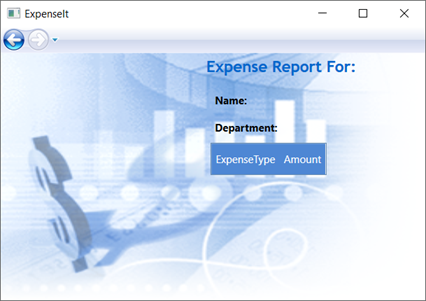 ExpenseReportPage.xaml displays the expense report for the person that's selected on the ExpenseItHome page. In this section, you'll create the UI for ExpenseReportPage. You'll also add background and fill colors to the various UI elements. 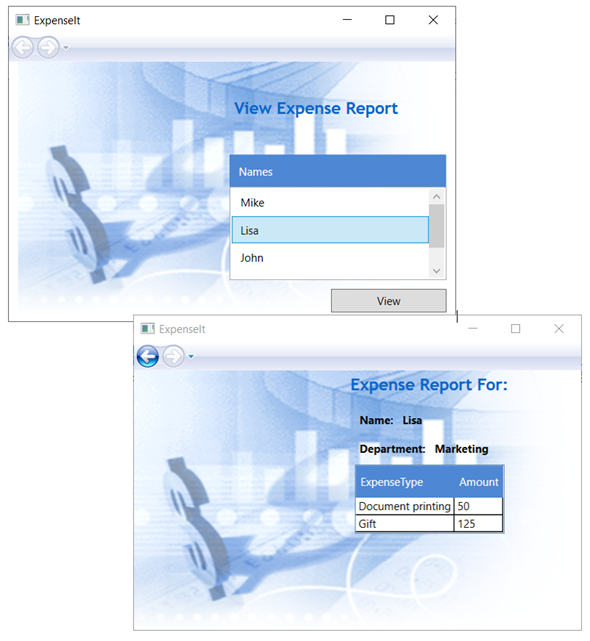 <Grid Grid.Column="0" Grid.ColumnSpan="2" Grid.Row="2" VerticalAlignment="Top"
This UI is similar to ExpenseItHome.xaml, except the report data is displayed in a DataGrid. If you get an error that the DataGrid was not found or does not exist, make sure that your project targets the .NET Framework 4 or later. For more information, see How to: Target a Version of the .NET Framework. The expense report page appears. Also notice that the back navigation button is enabled. The following illustration shows the UI elements added to ExpenseReportPage.xaml. The appearance of various elements is often the same for all elements of the same type in a UI. UI uses styles to make appearances reusable across multiple elements. The reusability of styles helps to simplify XAML creation and management. This section replaces the per-element attributes that were defined in previous steps with styles. headerTextStyle: To format the page title Label. labelStyle: To format the Label controls. columnHeaderStyle: To format the DataGridColumnHeader. listHeaderStyle: To format the list header Border controls. listHeaderTextStyle: To format the list header Label. buttonStyle: To format the Button on ExpenseItHome.xaml. Notice that the styles are resources and children of the Application.Resources property element. In this location, the styles are applied to all the elements in an application. 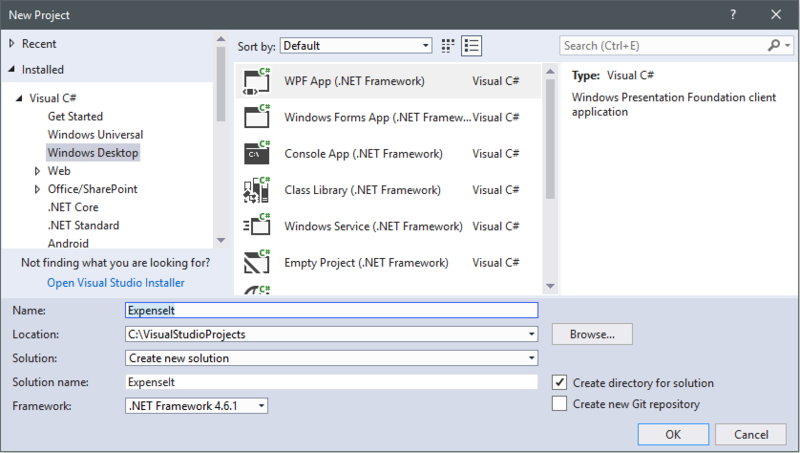 For an example of using resources in a .NET Framework application, see Use Application Resources. The properties such as VerticalAlignment and FontFamily that define the look of each control are removed and replaced by applying the styles. 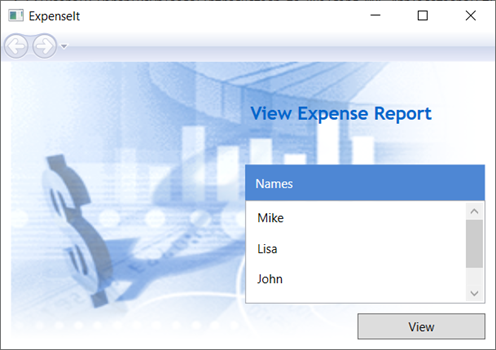 For example, the headerTextStyle is applied to the "View Expense Report" Label. This adds styles to the Label and Border elements. In this section, you'll create the XML data that is bound to various controls. The data is created as a Grid resource. Normally this would be loaded as a file, but for simplicity the data is added inline. For more information about data templates, see Data templating overview. This XAML binds the ItemsSource property of the ListBox to the data source and applies the data template as the ItemTemplate. Next, you'll add code to retrieve the name that's selected on the ExpenseItHome page and pass it to the constructor of ExpenseReportPage. ExpenseReportPage sets its data context with the passed item, which is what the controls defined in ExpenseReportPage.xaml bind to. Add a constructor that takes an object so you can pass the expense report data of the selected person. // Bind to expense report data.
' Bind to expense report data. Change the Click event handler to call the new constructor passing the expense report data of the selected person. In this section, you'll update the UI for each item in the data-bound lists by using data templates. Bind the content of the "Name" and "Department" Label elements to the appropriate data source property. For more information about data binding, see Data binding overview. Replace the DataGridTextColumn elements with DataGridTemplateColumn under the DataGrid element and apply the templates to them. Select a person and then select the View button.